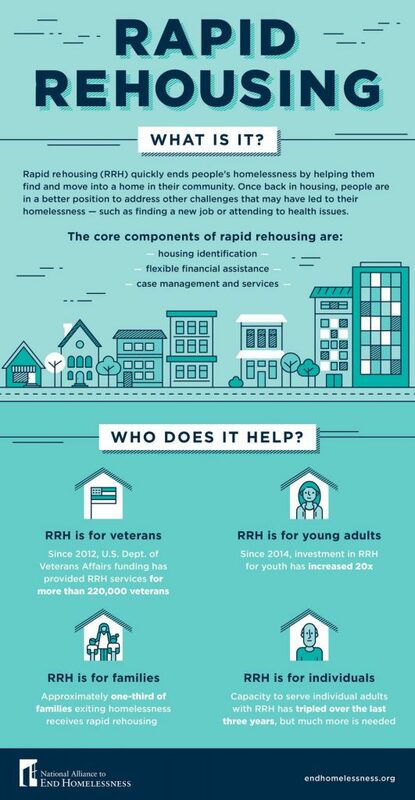 Rapid Rehousing is one of the Community Shelter’s three areas of service. We are committed to not only providing emergency shelter and food for single adults and families, but also to helping stabilize the homeless into permanent housing. Participants first enter our adult or family shelter program. If appropriate, they work closely with a case manager and housing coordinator to develop an affordable housing plan and the means to support that plan longterm including employment, health issues, budgeting, etc. Our housing coordinator is always looking to meet new landlords who might have vacant properties appropriate for participants’ needs. She works with both tenant and landlord on responsibilities and the common goal of stabilizing longterm housing for the client. Contact SandraClarke @unionshelter.org at 704.289.5300 for more information or to schedule a presentation on rapid rehousing at your church or community organization.